I have always loved Julia Stainton's style, and she is the muse at Case Study Challenge Blog for the month of October. 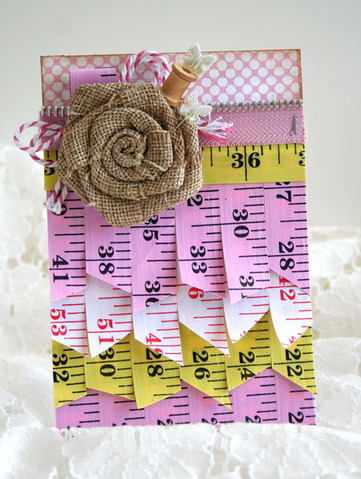 I LOVE her sample card for challenge #112! This is my take on her lovely style. Here is Julia's "Sew Trendy" Card!! Sew crafty!! Click on over to the Case Study Challenge Blog to see what the rest of the design team, and those of us playing along, created this week. TFL! Love your card! Are the dots and scallops stamps or patterned papers? Thank you! The dots are stamped with an old background stamp from CTMH, and the scallops are a new Hero Arts stamp" Lacey Background " co-branded with Basic Grey / Paper Cottage line.